School supply kits and teacher wish list Items are now available for purchase through the PTSA until Monday, August 13. Check this item off of your to do list and avoid the shopping crowds...AND support your PTSA! Your order can be delivered to your child's homeroom in time for the first morning of school, or you can pick up your order at Culbreth before or after the New Family Orientation event (date and times to follow). We also have teacher wish list items available for purchase, ranging from $10 to $35. Please consider purchasing items for our World Language, Cultural Arts, EC and elective teachers. Kids sneeze in the library, band room, and Spanish classes, too! Your wish-list items will be delivered directly to the teachers, with a label acknowledging the donor. Thanks for supporting your Culbreth PTSA. For more information on K-3 class size legislation, please read this article from the News & Observer. Join our local CHCCS PTA Council to visit the NCGA on Wednesday, Jan. 10th from 9am - 2pm to speak to legislators our about concerns with the K-3 Class Size Mandate. veryone is welcome. 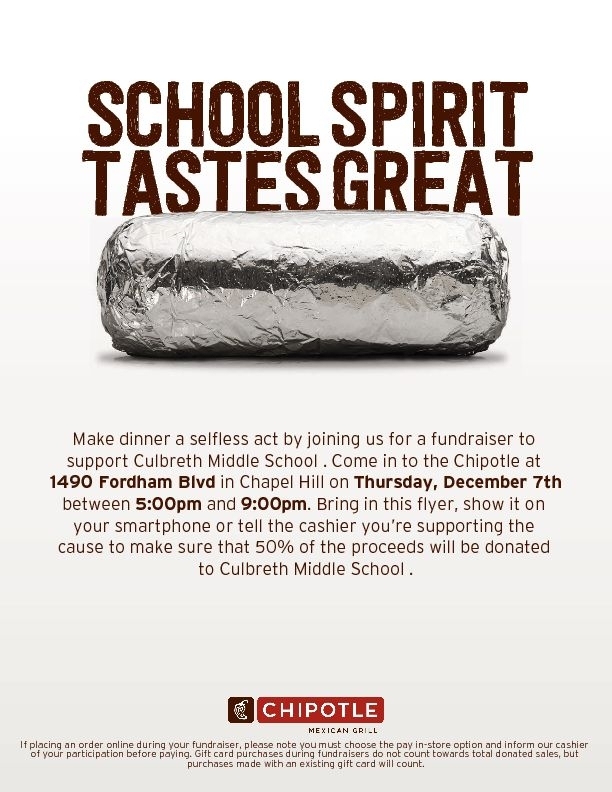 Eat at Chipotle Eastgate Thurs, 12/7, Show This Flyer on Your Phone, and 50% of Proceeds Go to Culbreth PTSA! Save Time and Support your PTSA! Order Your School Supply Kits & Teacher Wish List Items by August 11th! The PTSA has met with Student Council and Culbreth teachers to carefully curate the list of school supplies your middle schooler will need. Students showed us in May which brands of binders had survived the school year and which ones looked like they had been run over by a truck. They lamented the class notes they had lost when their parents bought filler paper without reinforced holes, and advised us when it makes sense to spend a little more for a quality product vs. when we can safely "go budget" on an item. The kids told us what color schemes they like, and had a spirited discussion about the ideal binder size. We worked with teachers to get as much consistency as possible across grade levels, and culled the list, moving some items from required student supplies to teacher wish list. After all, what parent really wants to buy a whole box of sheet protectors when their child only needs two? After doing the research and hunting for the best deals, the PTSA presents to you one-stop shopping for school supply kits. You can order them with just a few clicks on your phone, tablet or computer, between now and August 11th, and pick up your supply kit on August 25th, or the kit can be delivered to your child's homeroom in time for the first day of school. Teacher wish list items can also be ordered online, and the PTSA will deliver them directly to teachers in your child's grade. No fighting the crowds at office supply stores. No trying to talk your children down from begging for a hundred cool things they "need" that aren't on the list. No making your kid schlepp a giant multi-pack of Clorox wipes to school that first day. We will take care of all the details for you. You're welcome! If you have questions, are a very thorough person who likes to know ALL the details (we respect that! ), or just love to read, keep going. If you're ready to order now, visit our online store. Q: Why is the PTSA selling school supply kits? A: For two reasons. The first is as a convenience to parents who find the school supply shopping process cumbersome and time-consuming. The second is to raise a little money for the PTSA, to partially replace the annual distributions we no longer receive from the PTA Thrift Shop and the discontinued PSF Walk for Education. We especially like this fundraiser because it is low-risk (we only buy what parents have ordered and paid for) and we will know how much money we have raised before the start of school, which means funds raised can support your children during the current school year. Q: Am I going to pay a lot more than I would in the store? A: It depends. The PTSA is saving money by buying some, but not all, items in bulk, and charging you regular retail prices. If you are a person who enjoys scouring the ads every week and going around to different stores when they put things on sale, then these kits may cost slightly more than you would pay. If you are a busy person who doesn't have time to bargain hunt, you are going to pay about the same as you normally would, AND we do all the shopping and packaging for you. In any case, we hope you'll keep in mind that funds raised go directly toward support of your child's education. Q: My daughter doesn't want to get a pink notebook. Do I get to pick the colors, or will they be randomly assigned? A: After discussing colors with the students, we have come up with three color families. "Cougar Colors" will have a dark blue binder and accessories in school colors, such as blues, yellow, black, gray and possibly orange. "Bright Colors" will have a light blue binder and accessories in colors such as green, purple, pink, and different shades of blue. "Bold Colors" will feature a black binder with accessories in red, orange, green, darker blues, gray and black. We feel that these three color families will meet most students' needs and allow us to get the best deals for parents. Q: How will my child get his or her supplies? A: You have two options. The first is to have your supply kit delivered to your child's homeroom in time for the first morning of school. The second is to pick up your kit at Culbreth before (8:30 - 9:00 a.m.) or after (10:15 - 10:45 a.m.) new family orientation on Friday, August 25th. Q: What about teacher wish list items? The PTSA has asked the teachers what they most need and compiled a list. We were surprised at some things, such as the amount of copy paper a teacher needs to make handouts, homework and tests for your students! We have several different price points for donating items. Teacher wish list "kits" range from $10 to $35. The PTSA will buy items such as Clorox wipes, tissues, hand sanitizer, copy paper, dry erase markers and pencils in bulk and distribute them to teachers for you. We have separated teachers' wish lists by grade, so the supplies you buy will go directly to YOUR child's teachers. We also ask that you please not forget our World Language, Cultural Arts, EC and other elective teachers. Kids sneeze in Band, Spanish, and the library, too! Q: Can I donate a supply kit to a Culbreth student in need? A: Yes! For each grade's supply kit, there is a "donate a kit" option in the drop down menu. Q: What is the deadline for ordering school supplies? Q: Do you need volunteers to help assemble the supply kits? A: Why yes, we do! If you have some free time on August 23rd and or 24th to assemble kits, or the morning of August 25th to help distribute kits, we would welcome your assistance. More details on specific times will be sent out via email. If you're new to Culbreth, this might be a great way to for you to meet some other parents before school starts. Q: Why are the supply kits for some grades more expensive than others? A: Different teachers have asked for different supplies. Some cost more. Q: Is buying a supply kit through the PTSA mandatory? A: Absolutely not. You are free to buy your own school supplies. If you choose to do this, here is a list of what you'll need. We have a common list for all students, and a supplemental list for each grade. Additional binder pouch for cougar cash, locker combination, permission slips, passcodes, lunch numbers, notes to school and other small pieces of paper that middle schoolers tend to lose. Thank you for supporting your Culbreth PTSA!